A lovely photography-dedicated trip with Shannon Conway on the Rodney Fox Shark Expeditions boat 'Princess II' to the Neptune Islands in South Australia in June 2015. We were blessed with good conditions, although sea temperatures were a chilly 12-16ºC - drysuit water. The diving was safe, well-organized and the crew were superb and informative. We started diving at Tumby Bay to visit the elusive Leafy Seadragon and then travelled south to the seal-habitat of the Neptune Islands. 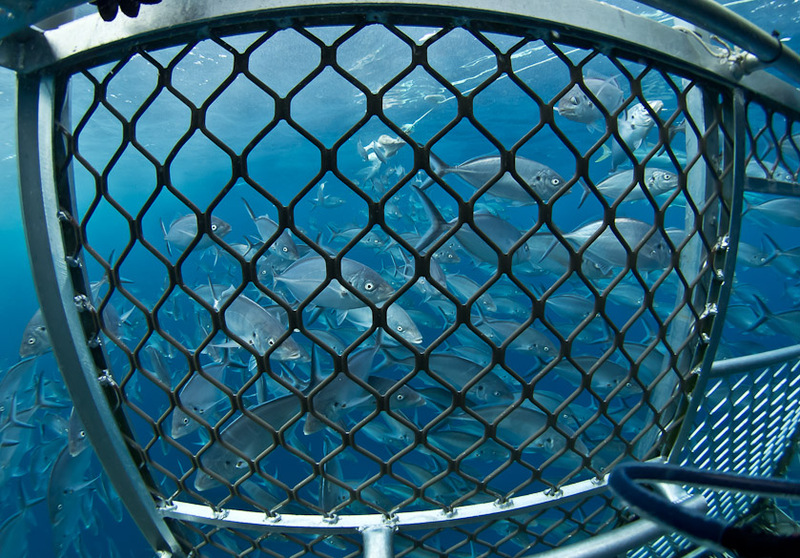 There were sharks aplenty to be viewed from the surface cage and a cage that was lowered to 15-20 m above a plain of white sand and seagrass with eagle rays, shoals of pesky trevally, speeding kingfish and of course sharks. Some of these splendid sharks had acoustic tags, were being tracked and actually had names. One was the massive 4.3 m, scarred female called 'Ali', although most were youngsters at about 2.5-3 m. At no time did we feel threatened, although I was glad of the cage. These powerful creatures are as natural and as essential to our Southern Ocean wilderness as the lion or leopard is to the African bush. Drum-line fishing for these magnificent creatures is completely inexcusable! This photogallery of 24 pictures is but a taste of what was there. A big 'Thank You' to Shannon, my WAUPS colleagues, and the skipper and crew of Princess II.